A specialized mailer for pictures you'd like to send to your family and friends. 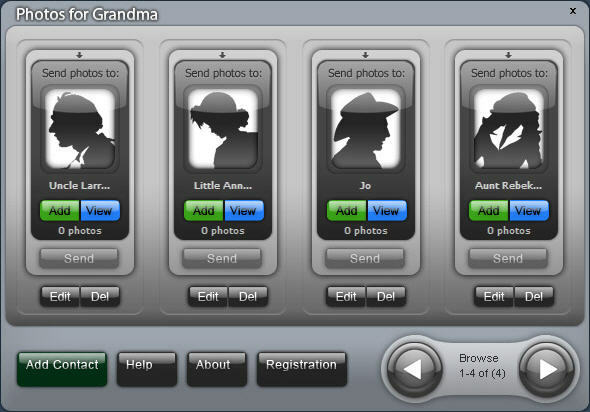 Photos for Grandma is a specialized mailer for pictures you'd like to send to your family and friends. Your only job with it is to select pictures to send, type in a message subject and choose its style. Fun and done. The program takes care of everything else. It resizes pictures, creates a message from a template and sends it through your default email account. It even rotates pictures that have orientation EXIF tag. Photos for Grandma is a specialized mailer for pictures you'd like to send to your family and friends. Expert Email Validator - a simple and very powerful tool for anyone to verify email addresses (including Yahoo mail) for undeliverable email. GSA Email Verifier - verify email addresses from Mailing Lists, Microsoft Outlook Contacts, Windows Address Book and a lot other formats to determine if they are still valid. JOC Email Checker - remove unwanted emails (like spam, huge attackments) direcly from your POP server, without downloading with your email program. E-mail Admin List - Email management software for managing a mailing list, such as: Remove duplicated emails; Split a large list; Filter a list to extract specific address; Sort a list and so on. Classic Menu for Outlook - The software allows you to work with Outlook 2007 as if it were Outlook 2003. All the new features in Microsoft Outlook 2007 have been added into the Main Menu, the Standard Toolbar and Formatting Toolbar. Desktop Emailer Professional - It is an affordable mailing list management software that allows you to send out high volume, highly personalized text or HTML email messages with unlimited attachments. Mail Manager - A powerful bulk email software which can deliver bulk email fast and securely. PC iMail 2006 - A Email manager, it can create and send HTML newsletters with attachments and mail merge fields, also it could prevent your Email and PC for adware and spyware attack. Business Letter Professional - Help you write business letter with 1,000 templates, and enable you to edit, copy, paste, search, preview and save your letters.